It's one of the odd factoids of metal obscurity that in the face of a time when grunge owned the rock airwaves and many of the 80s-era greats were already throwing in the towel, Wicked Maraya was turning out a gem in the form of 1994's Cycles -- which, alas, was pretty much uniformly ignored. But with the band's reformation, they've released a "new" album -- not really new, but an old one prior to Cycles that never got released, with two new tracks. Rougher around the edges than their masterpiece, Lifetime in Hell has nonetheless stood the test of time to some degree, giving fans the missing prologue of the band together with some promise of more to come. 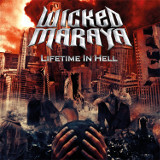 Lifetime in Hell is a straightforward heavy metal album rather than incorporating the grunge and groove elements that Wicked Maraya successfully brought into Cycles; after all, at the time it was created, the grunge scene was mostly unknown. Fans of Queensryche or Crimson Glory's classic era, however, will find this instantly familiar, complete with the ominously echoing clean-chorus guitars on quiet portions giving way to the snappy palm-mute riffs. Occasionally the harsher edge to this sound that the band brings to their songs, especially the unusual amount of screams that vocalist Lou Falco lets out, gets a little hard on the ears, but songs like Sounds of Evil or Tomorrow's Child could have been instant classics both for that era and Wicked Maraya s own history. It's hard not to compare what would have been an excellent album for its time with the greater album that was released later. Johnny, for example, has the weird creativity the band was always capable of putting to good use, but compared to its later version (it was on Cycles too), it's clear that they made it substantially better later just by changing a few of the chords and tweaking the track a bit; and a couple of the tracks don't make much of an impression. But even on more meat-and-potatoes tracks, it's fun to see what is done with more traditional metal sounds, like the speed metal of Blackout, an instant headbanger to which this scream-filled version of Falco's delivery is perfectly suited -- and even there, the time-signature changes and abrupt instrumental curves thrown in prove that even on a style others have done before, they can bring their own sound to bear. And the new material? It's quite sound, little to complain about and no tectonic shifts in direction, and Falco's voice has aged relatively well, though the production isn't anywhere near as in-your-face as the previous tracks, which is kind of a surprise. Fall From Grace, despite being produced in the here and now, is more like something that would fit on Lifetime in Hell during its first debut, but Suicidal Dawn is darker and heavier, with more of the groove you'd expect from a band that was able to adapt more cleverly to 90s heavy rock than many of their contemporaries. These two tracks, both of which are solid rather than brilliant, yield no information as to the band's future direction, contradicting even each other in their different moods. But perhaps that is as it should be; after all, in a Wicked Maraya album, contradictions are nothing new.